Raise funds while you recycle! Bag It Up (BIU) Group is one of the leading textile recycling organisations in the UK. 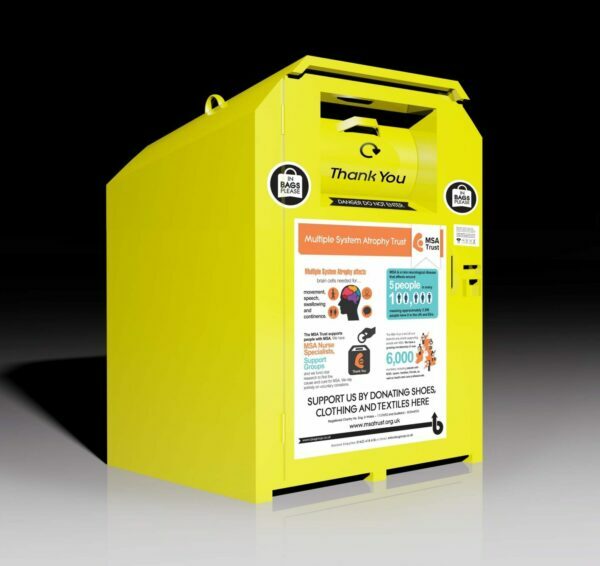 They provide patented anti-theft clothes recycling banks across the country. Used clothing and shoes donated to the banks are then resold. MSA Trust receives part of the sale proceeds. The Trust is proud to be working with a partner which enables less waste to go to Landfill while raising vital funds for people affected by MSA. Banks are branded with information about MSA and the Trust, so this is a great way to raise awareness of the condition within a community. There is no cost involved for the Trust or the venue hosting the Bank as BIU provide all the equipment and services needed to operate the recycling scheme. BIU only sell to recognised sorting or grading partners who in turn sell in markets where trade is free and fair. They have internal audit procedures that ensures these standards are maintained. There is a MSAT recycling bank located at the Wilmslow Garden Centre (part of the Klondyke Garden Centres) near Manchester. If you live close by, please donate your old clothing and shoes to this bank! Proceeds from sale of donations collected here goes exclusively to MSA Trust. So encourage your family and friends to donate as well – every little helps! BIU makes every effort to secure new venues for placing the banks but would appreciate local knowledge. So, this is where you can get involved. You can suggest a new venue for having the bank placed, and help the Trust get the resale proceeds from items donated at this new bank. To find out what makes an ‘ideal venue’, click HERE. If you think you know of such a venue email us. If you think it’s more appropriate, then please make initial contact with the venue. Although this is not a requirement, it sometimes helps for the enquiry to come from a local or ‘known face’. You would need to only ensure whether the venue/site owner would permit the banks to be placed. There is no further commitment required from you. Unfortunately, BIU have partnerships with other charities in Dorset, Somerset, Berkshire, Oxfordshire, Buckinghamshire, Bristol, Bath, South Gloucestershire, Gloucestershire and Yorkshire. Therefore, sadly we cannot place banks in these locations. So, if you can think of any other, please get in touch. We will forward your suggestion to BIU who will contact the venue. There is no further commitment needed from you. This would be an amazing way to support the Trust, while helping people to ‘declutter’. Thank you in advance for your support! Help the Trust while you shop for your groceries! With the boom in online shopping, you could raise much needed funds for the Trust every time you shop! Every site you shop on using the Give as you Live portal, they will donate a percentage of your purchase to the Trust at no extra cost to you, as the store donates the money, not the shopper. So the next time you go online to shop, do so via Give as you Live as an easy way to support the Trust. 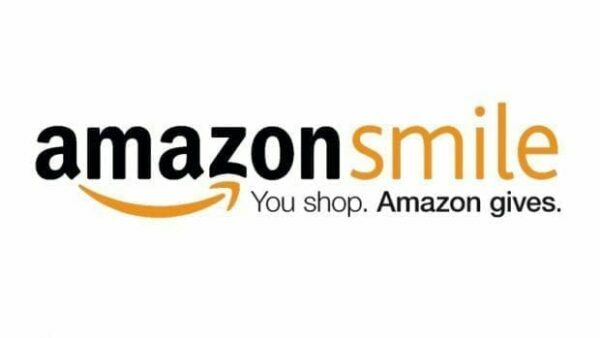 When you shop through Amazon Smile, Amazon donates a percentage of the proceeds to MSA Trust, with no extra cost to you. All you need to do is visit Amazon Smile, log into your account and select the ‘change your charity’ button in the ‘Shopping Programmes’ section. You can then select us as your chosen charity and start shopping! Get more out of your order with Amazon by supporting MSA Trust and visit Amazon Smile today! Support us today through Facebook Donate! 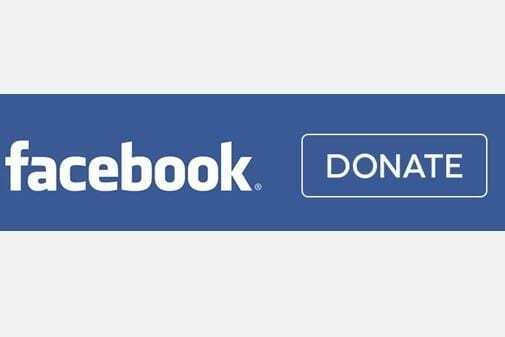 We spend so much of our time on Facebook, now there is a way to support the Trust through it! Whether you would like to start up a Birthday Fundraiser in aid of the Trust or make a one off donation, you can do so by heading over to our Facebook page and clicking the ‘Donate’ button today! Everyclick.com is a search engine with a big difference. It is completely free to use and works just like Google, Yahoo or Bing by letting you search the web, but each time you search on Everyclick.com you can help to raise money for the Trust. Everyclick.com has already raised over £1m for UK charities. Don’t delay start Everyclick today!